Our technology partners in The Great Conversation supply us information that extends our imagination on how we might apply technology to today’s problems. We felt this was an interesting story that was published in Security Today and is provided by permission of the publisher. It profiles two technologies and vendors that came together in a holistic solution that will be featured at The Great Conversation. There are a handful of amazing things that set San Francisco apart from other world class cities. Notably, there is the Golden Gate Bridge, Alcatraz Island, Fisherman’s Wharf and Chinatown; the Twin Peaks overlooking the city, San Francisco Bay, and yes: The Moscone Center. Just how does a convention center fit into the list of places to see in beautiful San Francisco? It is the largest convention and exhibition complex in San Francisco. It includes three main halls spread out across three blocks and 87 acres in the South of Market neighborhood. The convention center originally opened in 1981 and has gone through several renovations. It is currently upgrading its security system to reflect a best-of-breed, state-of-the-art solution. Security at the SMG/Moscone Center is handled similar to the security at a Tier 1 airport; however, clients who use the facility are required to provide their own inside security. When the doors are open to the public it plays host to people who want to come in and look around. Like any major metropolitan area, there are issues that have to be dealt with that aren’t pleasant and keeping track of the homeless population and what they are doing is one such issue. “We are able to place the new IP cameras in places where the homeless population congregates on the outside, in dark corners of the facility,” Ellis said. The Moscone Center complex consists of three main halls. 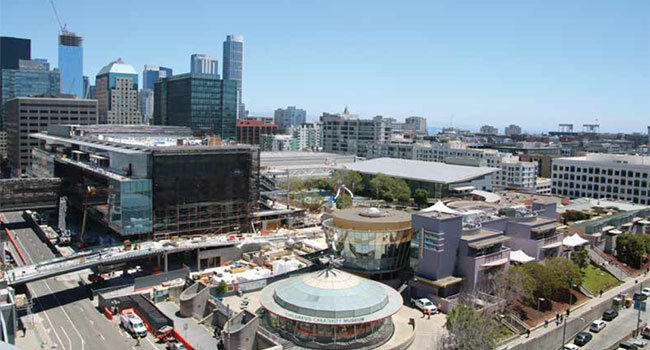 Moscone South is located to the south of Howard Street and is three stories tall.